This is the sort of release which might well have passed me by since it lies well outside my normal areas of interest – or comfort zone, if you like. However, I was greatly intrigued by Dan Morgan’s review of the release as a DXD download, so I decided to take the plunge. In approaching these recordings of music that was completely unknown to me I faced one handicap. Christopher Rountree’s booklet notes, while enthusiastic, do little to explain the pieces themselves to anyone unversed in these matters. Thus, it wasn’t always clear to me what the pieces may be “about”. Furthermore, as so often with contemporary composers the titles weren’t always helpful. So, what I decided to do was to sit back and listen to the pieces as sound experiences – and, of course, to enjoy and marvel at the virtuosity of the LAPQ. 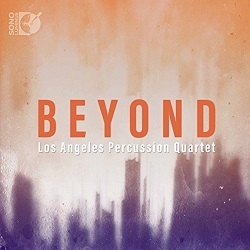 Christopher Rountree says: “Beyond is a remarkable epic in which space and time are stretched on and on, over and past the horizon.” I took an inference from this statement – perhaps wrongly – that even though the composers had designed their pieces individually the LAPQ had determined to present them on disc as a sequence. Consequently, though I dipped into the album a couple of times when I received it, when I sat down to do serious review listening I auditioned the disc straight through as a sequence and, in the same spirit, I’ll write about the contents in order. Before starting I should just comment about the two formats in which this release is presented. There are two CDs, with I Hold The Lion’s Paw occupying the second disc. However, beyond sampling the CDs to check the sound quality – which is truly excellent – I used the BD-A disc for my review listening on the presumption that this would present the music and the recordings in the best possible light. I’m not equipped for surround sound so I used the 2.0 LPCM 24/192kHz option. During the course of this review I’m going to mention a number of online videos which I subsequently discovered of the LAPQ playing these works. These definitely added to my understanding but I’d strongly recommend that you do as I did and listen to the Sono Luminus recordings first. That way, the sheer inventiveness of the sounds in the various pieces will make their maximum impact. Then, and only then, explore the pieces further using online resources. The Icelandic composer, Daniel Bjarnason’s Qui Tollis is for amplified percussion quartet though the listener is left to assume that amplification is used since this isn’t mentioned in the notes. If you search on the web you can find a short YouTube video of the recording sessions which includes comments about the piece from the composer and members of the LAPQ. It’s great to see the players’ enthusiasm for the piece and to watch them at work, conjuring up the sounds. The piece starts almost from nothing with soft shimmering sounds on high instruments, which are tuned, I think. In the middle of the piece insistent, pounding deep drums dominate, their sound enhanced by amplification. In the closing section of this continuous piece the dynamic levels fall back once again and what I think may be bowed vibraphones are prominent, again enhanced by amplification. This is a fascinating way to begin the programme. A visit to the website of the American composer, Christopher Cerrone established that Memory Palace is for solo percussionist and electronics though it can also be performed, as here, by percussion quartet. Cerrone explains that “Memory Palace is a kind of paean to places and people that have deeply affected me. The title refers to an ancient technique of memorization that helped orators remember very long speeches by placing mental signposts in an imaginary location and ‘walking’ through it. In this piece, the palace is my life. The crickets in the first movement, “Harriman,” were recorded on a camping trip with two old and dear friends. The recording of windchimes in the third movement was recorded at my parent’s house in their backyard. The sounds in the piece are signposts; they help me remember—and more important, understand, who I am. Memory Palace is in five sections. In the first we hear what seem like random notes plucked on the guitar with the crickets chirruping in the background. The second section picks up the pace significantly with fast tremors played on the wood slats – the use of different mallets varies the sound that’s produced. Here the recording is superb; there’s great definition and perspective. The third section is very restful as bowls and windchimes are softly struck. The fourth section is very fast indeed; so far as I can tell it’s the metal pipes and wooden slats that are used to drive the music forward frenetically. I think this is the most rhythmically ingenious movement of all and the fabulous recording really delivers. Finally, the tuned wine bottles are used to bring the work to a slow, dreamy conclusion. Here the sounds are not unlike those one has heard on the soundtrack to one or two space exploration films in scenes where astronauts float independently of the space shuttle. Memory Palace is a terrific experience. I wasn’t able to find out anything concerning Fear-Release by Ellen Reid beyond Christopher Rountree’s assertion that the piece “takes us into a world of metallic voices, as if we’re listening to a rubbed piece of crystal from inside the gem itself.” It’s perhaps the most obviously percussive score. Even in the quiet passages the music is often quite jagged and fragmented. To be honest. I didn’t get much out of this piece, though I might have appreciated it more had I been able to discover what lies behind it. Andrew McIntosh’s I Hold The Lion’s Paw is by some distance the most substantial piece in the programme, playing for nearly 40 minutes. Christopher Rountree comments as follows: “The expanse [of the work] is that of a twelve-hundred page novel, in which each page has less than half a dozen words. Its sprawl is scrolled out like a web in air, as the quartet communicates effortlessly with one another across a cavern of distance. In one moment they sit still in space, another they rattle endlessly like the earth; they arrive where we are, simply putting musical puzzle pieces together” So now you know as much as I did when I first listened. I rather suspect that the work is directly or indirectly inspired by the poem of the same name by the fourteenth-century Persian poet, Hafiz. McIntosh’s score is absorbing if, perhaps, a little over-extended. On the composer’s website you can not only see a video of a full performance of the work by the LAPQ – an amazing sight – but you can even download a pdf file of the score, which gives you an appreciation of the complexity of the work. You will also find in the score a list of the instruments which each of the four percussionists plays. I believe that in performance the ideal is for the players to be situated at distances from each other and with the audience in the centre so that for the listener the piece is immersive. With such a layout each audience member will see some of the players in action but they’ll only be able to hear what is being played by any players who are out of their sight. I guess that you’ll get the optimum effect if you can listen to this recording in surround sound but I have to say that even in plain vanilla stereo the effect is pretty spectacular at times. Having taken a look at the score I’m lost in admiration for the way these players hold it all together, even though it’s possible for one player or another to beat time with a free hand sometimes. Among the large array of instruments called for is a set of 13 tuned aluminium pipes, cut and tuned by the composer himself. In addition, each player has a ceramic bowl into which they’re instructed to pour water to varying degrees at various times during the piece so that the bowls make different pitched sounds when struck. If all that sounds pretentious or weird, rest assured; the collage of sounds that McIntosh gets his players to conjure up like aural alchemists is by turns exciting and ear-teasing. I think the piece is a bit too long but it’s intriguing from start to finish. Beyond is a fascinating, ear-opening experience. The pieces are all inventive and full of interest. The members of the LAPQ play with subtlety, flair, imagination and jaw-dropping virtuosity. As for the Sono Luminus recording, it’s a triumph for producer Dan Merceruio and the engineering team of Daniel Shores and David Angell. The instruments are recorded with stunning realism and presence. Even in the straightforward stereo image you get a fine sense of perspective and space. It’s a long time since I’ve been so excited by the technical side of a recording. This release has really stretched my listening boundaries and for that I’m very thankful. Bravo!